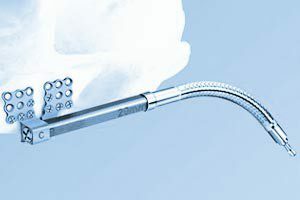 The DePuy Synthes Craniomaxillofacial Distraction System, manufactured by Synthes, Inc., a Pennsylvania company owned by Johnson Johnson (JJ), is an implant designed to lengthen and/or stabilize the lower jawbone due to mandibular defects or injury. It can be used on pediatric and adult patients alike to correct jaw-related deficiencies that are either congential deficiencies or post-traumatic defects. A craniomaxillofacial distraction system is designed to gradually lengthen the jaw using distraction osteogenesis. As the jaw is lengthened new bone fills in the preceding space creating sufficient length for the patient jaw, or stabilizes the jaw for healing after injury. However, on August 8th, 2014 the FDA issues a class 1 recall following a DePuy Synthes recall of certain lots of the Craniomaxillofacial Distraction System because the device may reverse direction and lose the desired distraction distance after surgery. As of April 2014, there were 15 reports of injury associated with the DePuy Synthes Craniomaxillofacial Distraction System. If you or a loved one suffered complications or injuries following DePuy Synthes Craniomaxillofacial Distraction surgery, you may be eligible to file a DePuy Synthes Craniomaxillofacial Distraction lawsuit against DePuy. To learn more about the legal options available to you, please contact the DePuy Synthes Craniomaxillofacial Distraction lawyers at Alonso Krangle LLP by filling out our online form or calling us. It costs nothing to find out your legal options, and you pay no fees until we win your case.